The RM 2900 bridge in Texas collapsed Tuesday morning as the Llano River rose near 40 feet amid heavy rains and sever flooding. A bridge in Texas collapsed Tuesday as heavy rains throughout the state caused severe flooding. 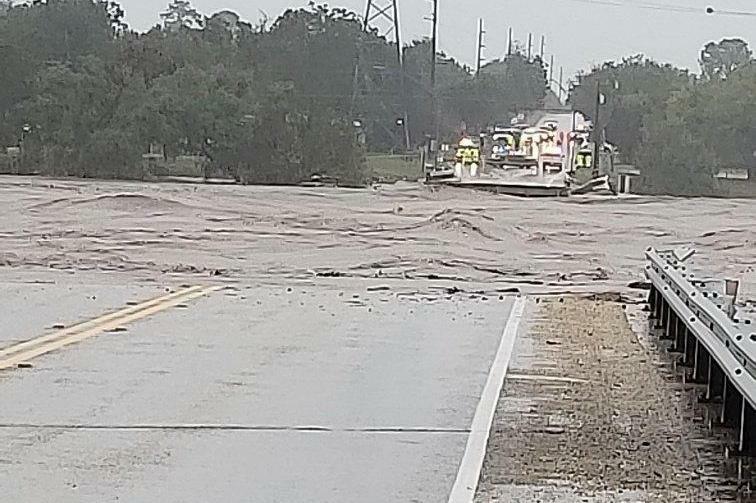 The Texas Department of Transportation shared video of the RM 2900 bridge in Kingsland after heavy floodwaters washed a portion of the bridge away. "The power of water," the department said. The bridge collapsed around 9:15 a.m. and no one appeared to be traveling on it at the time and no deaths or injuries were reported. It spans over the Llano River, which was expected to crest at a record-setting 41 feet amid the heavy rains. Meanwhile, in neighboring Burnet County, sheriff's officials said a person's body was recovered from Lake Lyndon B. Johnson on Tuesday afternoon. The body was found in the water near the east bank of the shore and the person wasn't immediately identified. Gov. Greg Abbott issued a state disaster declaration for 18 Texas counties affected by the flooding. "Texas is taking immediate action to respond to the threat of recent severe weather and flooding across the state," Abbott said. "We have made available all necessary resources to respond as quickly and effectively as possible to this disaster, and to assist those in harm's way. I thank all our first responders and local officials on the ground in these communities for their efforts to assist fellow Texans during this dangerous event." He also ordered increased readiness of the Texas State Operations Center along with a number of state and partner agencies. "When severe weather strikes, Texas will ensure our responders and local officials have what they need to respond and protect those in harm's way," he said. "I also urge all Texans to take their safety into their own hands by closely monitor changing weather conditions and heeding warnings from local officials."